Dr. P.B. Kanna Kumar is presently working as an Assistant Professor in Karnatic music-vocal in the Faculty of Music and Fine Arts, University of Delhi. He developed a keen interest in Karnatic music from his early childhood. His passion for music impelled him to pursue his educational career in Karnatic music under the modern University system to obtain finally Ph.D. degree in music from University of Delhi. He has toured widely in India giving a number of concerts in many well-known organizations. Kanna Kumar is a graded artiste of All India Radio, Prasar Bharati and Doordarshan, Delhi. 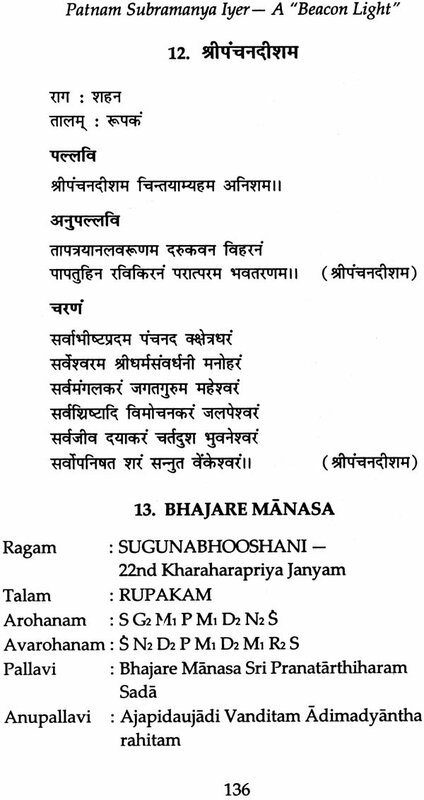 He is well-known for his clarity of Sahitya and communicating the correct Bhavam in rendering of the songs. His music has the blend of traditional and modern requirements. He has to his credit a number of cassettes, He has to his credit a number of cassettes, C.D’s prizes and awards from prestigious institutions of the country. Karnatic music has been justly acclaimed as a system of music with inexhaustible wealth of compositions. The compositions serve the vital purpose of retaining the structural solidarity of a system of music and this is the reason how Krnatic music has maintained an unmistakeable image of its own in the midst of various other competing systems of music. A very prominent name among composers who have made solid contribution in this regard was PANTNAM SUBRAMANYA IYER who was fondly nick named as “Chinna Tyagaraja” even during the life time of the Patriarch. He occupies a very special place among composers and any serious study of Karnatic music will not be complete without a proper analysis and understanding of the contribution of Sri PATNAM SUBRAMANYA IYER. Dr. P.B. KANNA KUMAR has made an intensive research on Patnam Subramanya Iyer and has now flowered into an author of a book exclusively on the great composer. 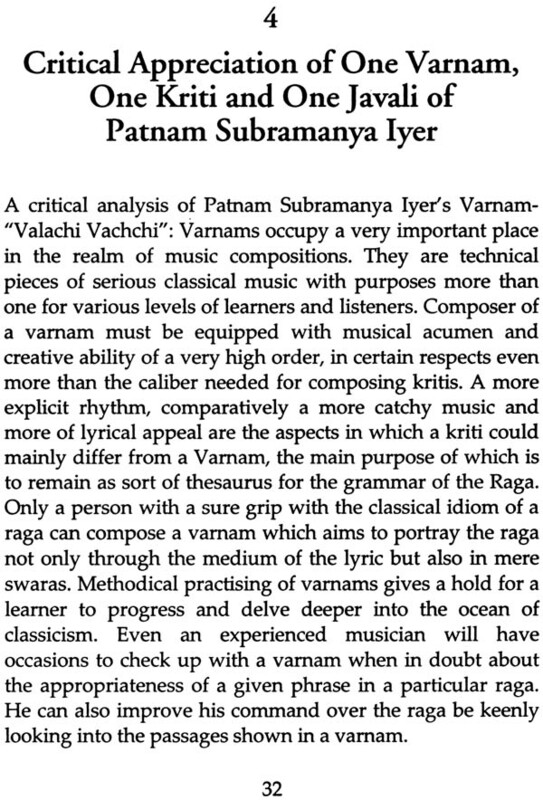 The book is sure to be high reference value to all researchers and practioners of Karnatic music. Some rare Varnams, Kritis, Javalis and Tillana in Devanagari and English script have been annexed to enhance the authenticity of the book. 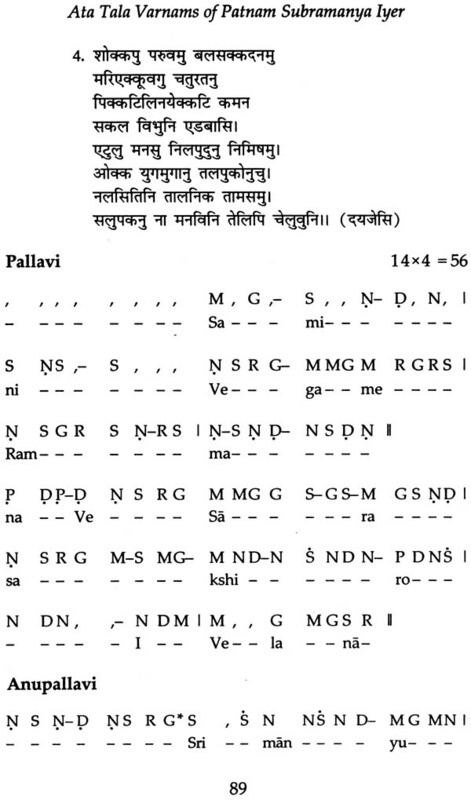 The book is a valuable addition to publications in Karnatic music. Spirituality among Indians, owes its existence to the great poets, philosophers and saint singers who have contributed to its development from time. 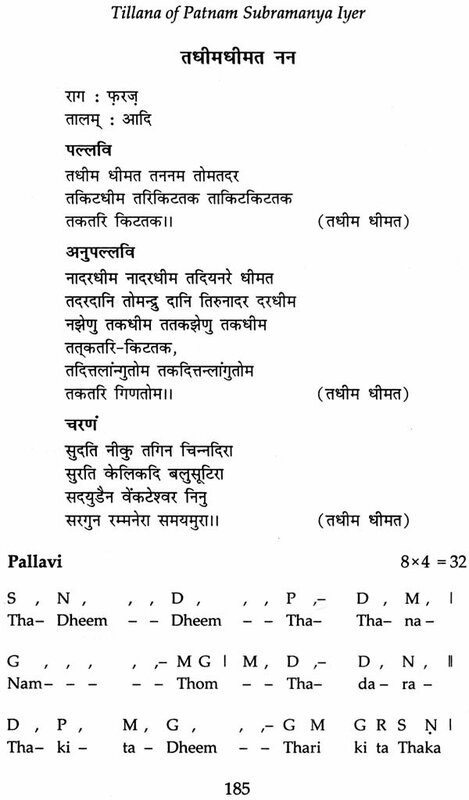 In South Indian classical music i.e. 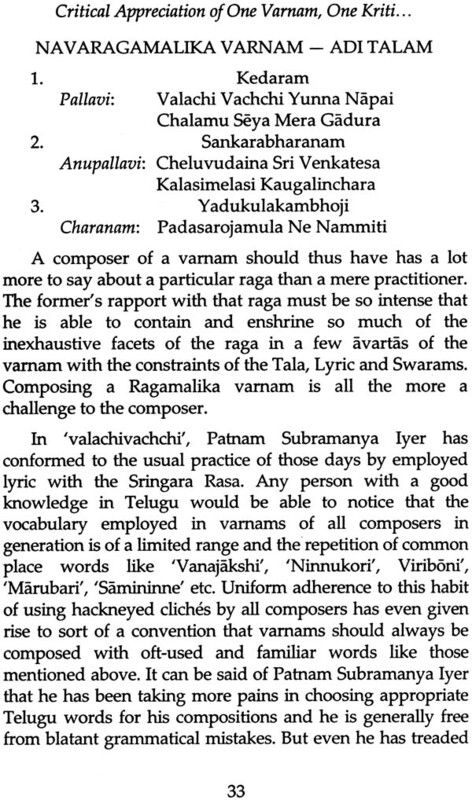 Karnatic music the era of Trinity composers (Tyagaraja, Muthuswamy Dikshitar and Syamasaatry) is called the Golden era, due to its unique speciality. It paved the way for further development in traditional and bhakti-oriented music. The Trinity’s compositions have always reigned supreme allowing only a subordinate co-existence to the composers of future generation. At the end of the Golden era they had set impeccable standards for the rest to fallow. 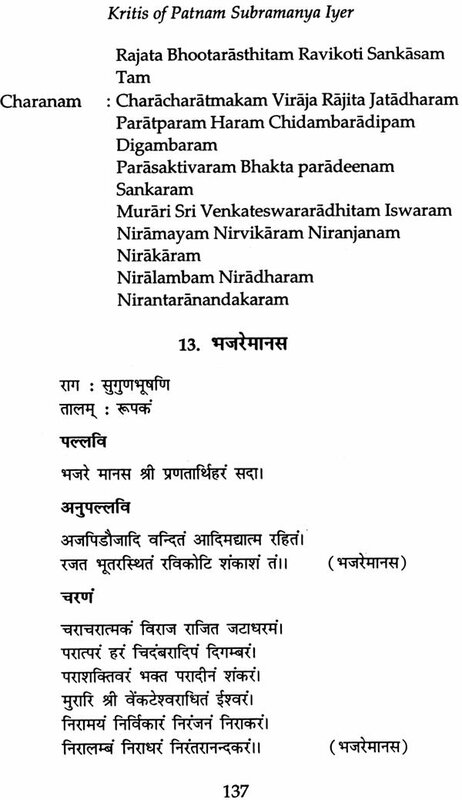 After the Trinity period propagation of spirituality through music continued with the efforts of the Post-Trinity Composers, Prominent among them being PATAM SUBRAMANYA IYER, working is the subject of this book. Patnam Subramanya Iyer followed the footsteps of Tyagaraja, he followed the great saint in the flow of Dhatu, Matu and structural format and also in the language chosen as medium i.e. Telugu though his mother-tongue was Tamil. He was therefore aptly called “Chinna Tyagaraja “. Among the Post-Trinity Composers, he is a beacon light. Though known to be a traditionalist, he was good at innovations too. 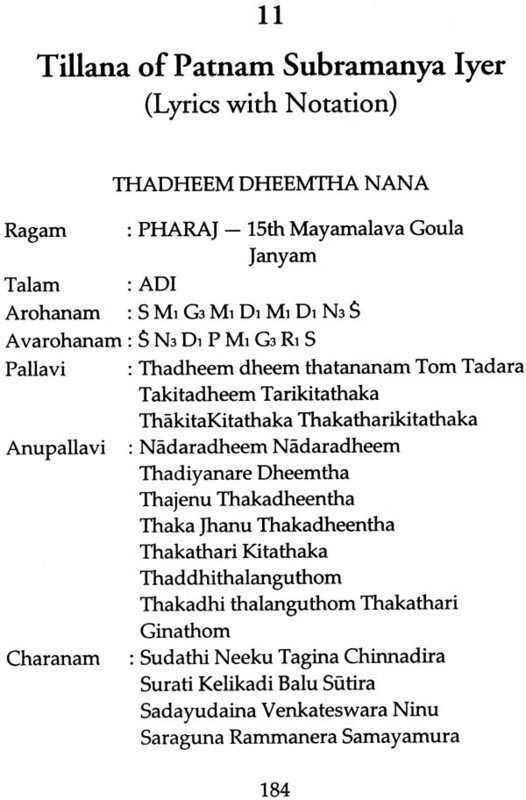 Some of his compositions as “Raghuvamsa Sudha” in the raga Kathanakuthuhalam which resembles Western music, are very popular even today. It gives me immense pleasure to write about this great composer and have tried to cover as many Varnams, Krritis, Javalis and Tillanas as possible. I hope that this work would be a very valuable for students, musicians, teachers and all music lovers. However, I would like to mention that this valuable work would not have been possible without the encouragement and full support of Sangeeta Mahamahopadhyaya Vidwan Sri T.R.SUBRAMANYAM. I would also like to thank Dr. RADHA VENKATACHALAM, Professor in Karnatic Music, Department of Music, University of Delhi for her valuable suggestions. I also acknowledge the help of my students and friends in bringing out this book. Last but not least I owe my acknowledgements to the Kanishka Publishers and Distributors, New Delhi, who undertook the printing assignment and completed the book within a short period. I have included some less known Varnams in Adi and Ata Talas with notation for the benefit of student and musicians with Roman and Devanagari Script. Usage of Diacritical marks have not been strictly followed. 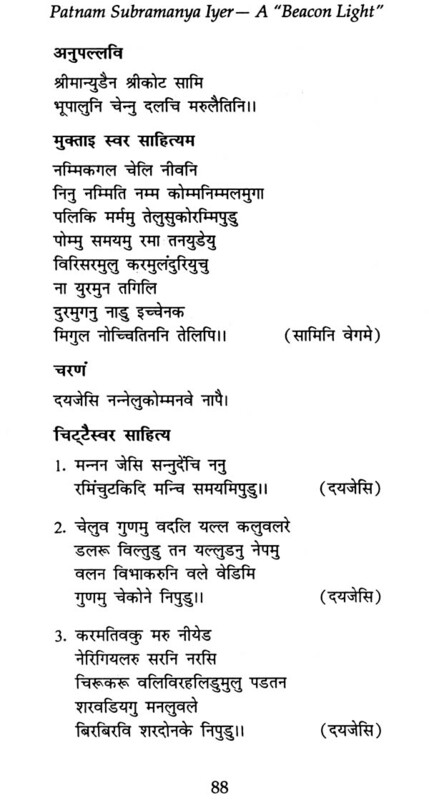 Only popular usage of spellings are used even in Kritis and other compositions.